Last week I talked about the My Color Story. Welcome to part two, where I take you through the Color Process. I’d like to mentioned I only color my hair. I do not cut it myself, for that I see a professional. I have gone to hair school and while I no longer practice, I do have enough knowledge to experiment on my own. I highly recommend when dealing with bleach to see a professional. If bad things happen – best case is you have yellow bleached hair, worst case you leave it on too longer and it falls out. All tips mentioned are what work for me. They might not work for you. I recommend checking out The Dainty Squid and her hair posts. My favorites are Hair Master Post, 7 Tips for Maintaining Bright Hair Color, and Two Tips for Switching Hair Color Easily. Consult. Either with the people you are purchasing the color from, or people who have experience with color. If you are unsure on anything, go to a Salon. Before I can get to Bright Purple I have to get my dark roots to a nice white blonde color. Have a well ventilated area, some good tunes to listen to, and as many mirrors and angles as you can get. What you'll notice in these pictures is there is no canvas covering the sink. With bleach I wasn't really worried, it tends to dry and not do much damage to things that aren't fabric. My hair is divided into four sections, straight down the middle, front of ears. I did the front two sections, then washed them out with a spray bottle and towel before moving onto the back. I did this because of how long it takes me to do and I didn't want the front to over process. Bleach burns, the scalp protector is a godsend. I have never used it before and it seriously is amazing! I would say from set up to finally wash this process took me two hours. I am very cautious around bleach as it can be a dangerous thing. I went slow when doing my roots, doing my best to make sure it was only applied to the root and not any of the purple hair. I actually allow my hair to grow for two months so I get a good inch of roots before doing this process. The more root you have the easier it is to apply the bleach yourself. I also take as small as sections as I can, so nothing is missed as applying. I follow the same prepare steps as mentioned above. The only difference is that I use the tube of color from Pravana and nothing else. There is no processing solution to be added, squeeze it into a bowl and apply to roots. 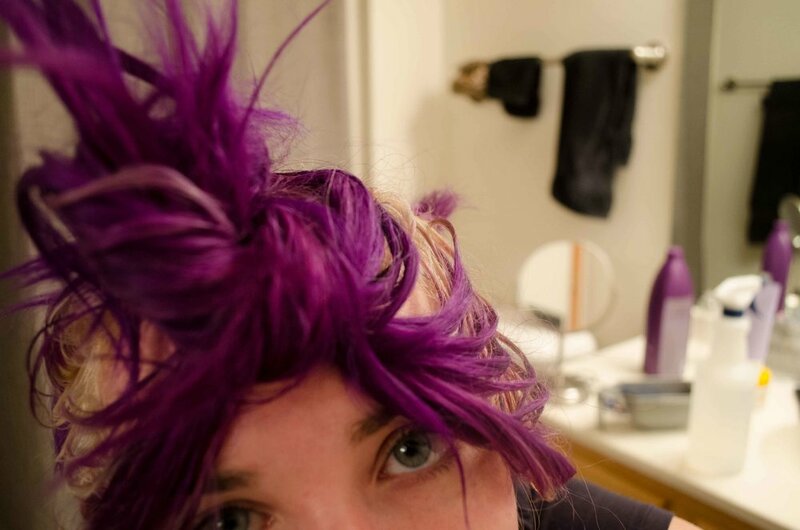 The process of purple is so much easier than bleach. I took double the size of hair as I did with bleach and mixed it in. It didn't matter it the entire strand was covered in color or just the root. In the end it all is the same color, so I don't have to be as cautious. 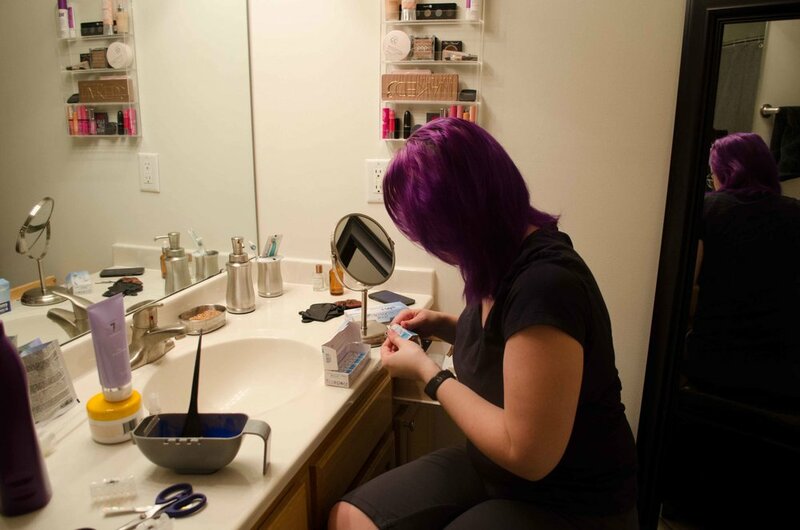 Come by next week to read about The Clean Up Process and My Hair Care!